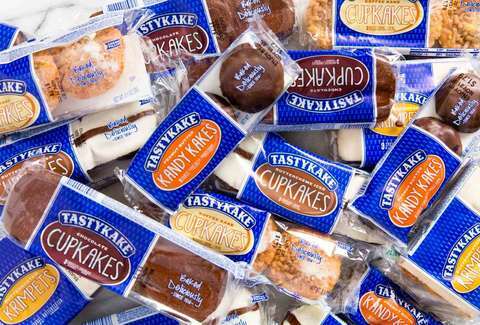 If you were raised on the high-fructose corn magic known as Tastykakes, that means a couple of things: You grew up in the Philly area, and you most likely have diabetes now. Was it worth it? Honestly, kind of. There’s no denying that these scrumptious nostalgia- and sugar-laden treats will always hold a special place in your clogged little heart -- and at the bottom of your brown-bag lunch (they fit perfectly down there and finding one buried under a PB&J and carrot sticks was akin to striking gold). After all, alongside the cheesesteak and the soft pretzel, they round out the city’s culinary trifecta. It’s not fun to pick on baked goods, but let’s be honest: Honey Buns are a bit of a breakfast afterthought. Their sticky glaze is a sugary delight and secures them a spot on this list, but they’re essentially a lesser glazed Krispy Kreme donut. Though popping them in the microwave does kick them up a notch. I don’t know about you, but my pantry growing up was always stocked with these tart, custard-filled pies, because my dad was straight-up addicted to them. The gelatinous lemon filling is surprisingly enjoyable despite its questionable consistency -- and who doesn’t love a pie on-the-go? -- but there’s a bit too much of the bland, crumbly crust for my liking, putting them lower in the ranks. The only person on-record who loves Snowballs is Jason Stiles on Gilmore Girls, when he enthusiastically chooses them on his grocery-store date with Lorelai. Other than Jason, these coconut- and marshmallow-covered dream cakes are lost on most of humanity, for whatever reason. 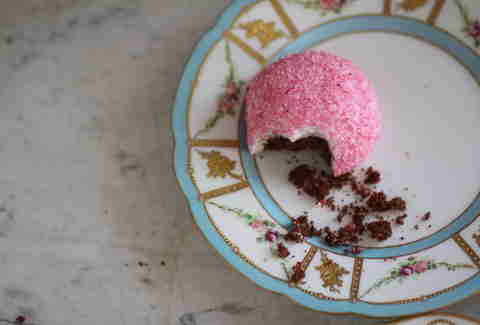 Regardless, these thick chocolate puffs, pretty in pink, crack the top 10 as a fluffy comfort food. OK, OK, let's address elephant in the room: Dreamies are basically just Twinkies. 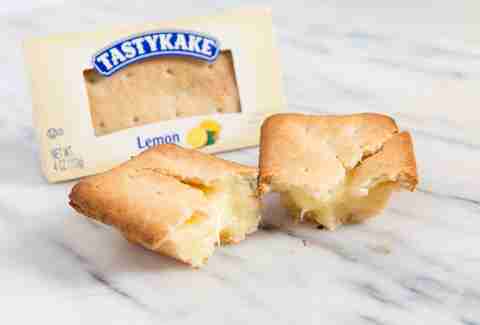 But you can’t deny that Tastykake nails these cream-filled golden sponge cakes. As the company says, “We call these dreamies because once you try one -- they will be in your dreams.” I thought my pillow was made of these the night of my tasting, so. Despite the fact that Chocolate Bells are oft-forgotten, they always hit the right note (sorry). 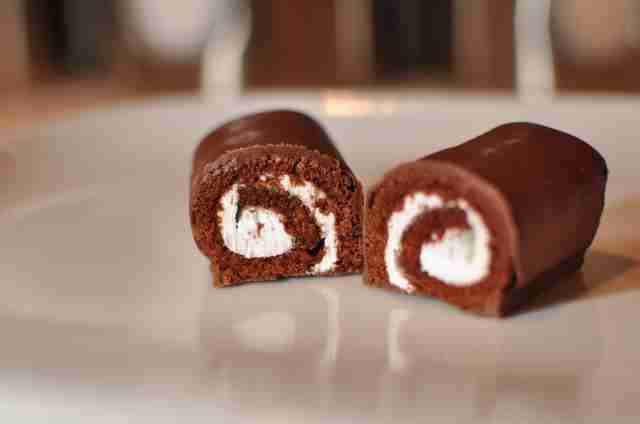 Their moist chocolate cake and vanilla cream filling, coated in a layer of toothsome chocolate, make for a timeless taste, and their unique shape and quadrilateral cross-section distinguishes them in the plastic-wrapped dessert scene. OK, and these are Ho-Hos. Which is totally fine by me. Entenmann’s this, Entenmann’s that. I’ve heard enough of that noise. Tastykake’s donuts (and donut holes, for that matter) deserve just as much praise, if not more, for the joy they bring to Philadelphians’ breakfasts. Their crumbly yellow cake and rich coating -- the chocolate-frosted and powdered-sugar varieties reign supreme -- make for a true morning treat. Speaking of morning treats, Koffee Kake Juniors, of the Juniors line released way back in 1917, are always a wholesome way to start your day, made even more delicious with a cup of joe. Their cake is perfectly thick, and everyone knows the crumbs on top are the best part. Don’t act like you didn’t lick your finger and pick each one off your plate. And the crowd goes wild. 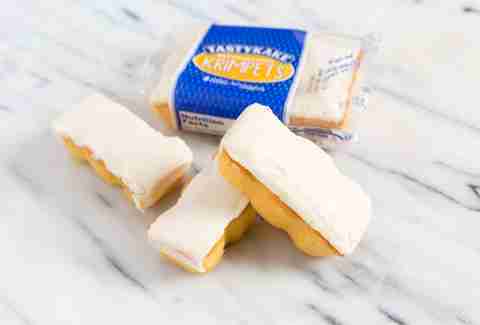 Butterscotch Krimpets are without a doubt the most iconic treat in Tastykake’s repertoire, and easily earn their place in the top three. With ridged sides that are ideal for fingertip gripping, these moist and pillowy golden sponges are cherished for their signature yet subtle butterscotch icing, and have become pretty freakin’ famous since their introduction in 1927. There really is no snack out there quite like these handheld cakes. 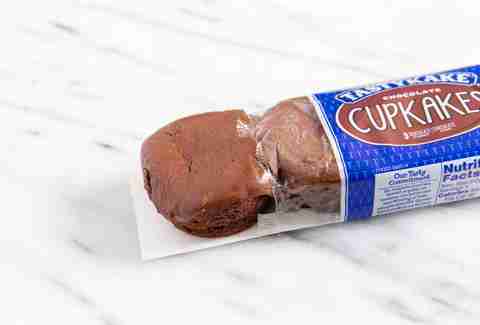 Step One: Peel chocolate icing off top and let melt in mouth. Step Two: Shove remaining chocolate cake into face. 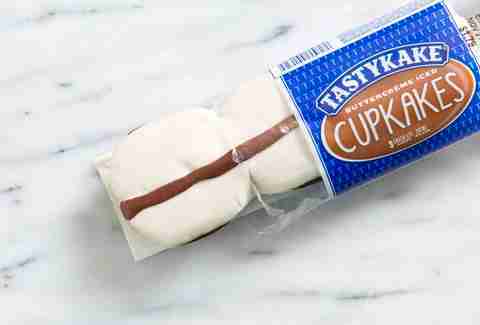 Tastykake keeps things scrumptiously simple with its classic chocolate cupcakes. These no-nonsense treats are just the right amount of moist and sweet, and are always an excellent choice of dessert, particularly with a glass of milk on the side. Put some angel food cake inside a Reese’s peanut butter cup and wham, bam, thank you ma'am: you’ve got yourself a Peanut Butter Kandy Kake. 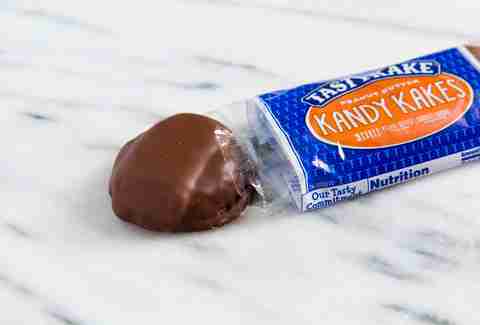 When you found a pack of these in your lunchbox it was the best day of your goddamn, elementary school life. According to Tastykake, they’ve been a bestseller since their unveiling in 1931, and you really can’t argue with history. The chocolate ones are a go-to, but the PB variation -- delicate sponge cake topped with peanut butter and coated with a thick layer of milk chocolate -- is a no-brainer for the #1 spot, especially when frozen. Throw a bucket of these buttery, sprinkle-dusted shortbread cookies in front of your relatives this holiday season and maybe they’ll forget to bring up politics?? Tom Vellner is an associate staff writer at Thrillist. His heart is warmed at the mere sound of the word “Krimpet.” Follow him on Twitter @tomgvellner.